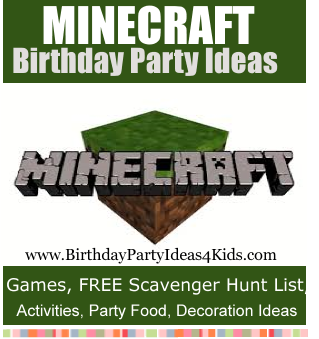 Fun ideas for a Minecraft party including ideas for Minecraft themed party games, activities, party food, favors, decorations and invitations. There is also a FREE Minecraft themed Scavenger Hunt list to print out with lots of fun Minecraft themed items to find! This is a fun relay style race that kids of all ages enjoy! Divide guests into two (or more) teams. The goal is for each team to fill up their bucket full of sand first. Give each team a bucket (or plastic gallon milk container) and a large spoon. Place the buckets on a small stool or box at least 30 feet from the starting point. At the starting point set up a large plastic container or small plastic swimming pool with sand or dirt. Have the teams line up one after the other. One at a time one person from each team takes the spoon, fills it with sand / dirt and then runs to the other end of the playing field and puts the dirt into their bucket, then runs back and hands the spoon off to the next player in line. Continue until one team has filled their bucket. Have a judge standing by the buckets to determine which team wins. This is a fun relay and great to play when it's hot outside! It is played almost exactly like the Minecraft Mining Relay (above), however instead of using sand / dirt the players use water. and instead of using a spoon to transport the water to the bucket they use a plastic solo cup. The fun part is that before the game a few holes are punched in the bottom of the cups so that they leak water as the players are trying to fill up their buckets! (To be fair make sure that the cups are leaking at the same rate. Or trade off cups every 5 minutes). Variation: This relay can also be played by replacing the leaky cups with large sponges. Minecraft themed stickers so each guest has a sheet with 8 to 12 stickers. When the kids arrive for the birthday party give each one a sheet of the Mine craft stickers. The game object is to be the first one to get rid of all their stickers by placing them on other party guests - without the guest knowing or getting caught. If caught placing a sticker on another guest they must take all the stickers off the party guest who caught them and try and place them on other kids. Only one sticker at a time. The first child who gets rid of all their stickers wins! Before the party hide diamond shapes (cut from poster board about 2" x 2") around the party area. Write a number on the back of each diamond that will correspond with a prize number. Let the party guests search for the diamonds. When all the diamonds have been collected let them turn in their diamonds for small prizes or candy that match the number on the back of their diamonds. You could also use plastic eggs for this game and fill them with candy or prize numbers. Before the party create a candy prize ball. You will need lots of Saran Wrap and candies / small toys. Start by wrapping a small ball with Saran Wrap a few times - you want the Plastic wrap to be in one long piece so don't cut it. Keep wrapping around and around with the plastic wrap and every so often put in a piece of candy or a small toy and then wrap over it. The bigger the ball the more turns each child will get during the party. To Play: Guests sit in a circle and one child is given the candy ball and the child next to them is given a pair of dice. On "go" the first guests tries to unwrap the prize ball and collect some candy. At the same time the guest with the dice is rolling the dice continually trying to get doubles. When they get doubles then the prize ball is moved to them and they hand the dice to the person next to them. Game play continues until all the candy / prizes have been collected. Tip: For older children you can use duct tape instead of plastic wrap to make this more challenging! Scavenger Hunts are a great game for birthday parties! We've included a free Minecraft themed scavenger hunt list with lots of items to find. Use one list for both teams or give teams different items to find. Cover tables with green plastic tablecloths. Black and green balloons are perfect for a Minecraft party ... simply blow up the balloons and use small pieces of black duct tape to make Creeper faces on the green balloons. Hang them around the party area. Use the same idea and make Creeper faces on green party cups. Use black square plates for the party table. Square paper plates in several colors of green and black can also be used to make a large pixilated wall mural. Simply tape the paper plates to a blank wall. Square pieces of construction paper can also be used. Great for in back of the party / cake / candy buffet table or as a picture backdrop. Cover large boxes with colored butcher or construction paper and create large life size Minecraft characters. Place them around the party area or at the party entrance to show guests where the party is located. Buy inexpensive green t-shirts and during the party let the guests paint black squares on the front to look like creeper. Let them dry during the party and give to guests as a party favor on their way home. Frost a sheet cake with green icing. Cut into square pieces and arrange pieces on a large platter with spaces in between each piece. Decorate the pieces of cake with frosting or candies to look like Minecraft characters. Cut Rice Krispie treats into squares and frost with green icing. Gold wrapped chocolate or chocolate coins. Dip large pretzel rods into white candy melts or Almond Bark and then sprinkle red and orange sugar crystals on them to make edible torches. Use a square cookie cutter to make almost any food a Minecraft party food ... sandwiches, Jello Jigglers, cookies, brownies, cheese and luncheon meat and fruits. Decorate a green Chinese food take out container with square pieces of black duct tape or draw the squares onto the box with a permanent black marker. Decorate a green paper bag with a Creeper design. Fill with party favors. Create a Creeper design on the front of green plastic cups (the tall kind with lids and a built in straw) and fill with candy and small toys.